A generation has passed since the Norlanders' great ships bore down on Shadar, and the Dead Ones slashed and burned the city into submission, enslaving the Shadari people. Now the Norlander governor is dying and, as his three alienated children struggle against the crushing isolation of their lives, the Shadari rebels spot their opening and summon the Mongrel, a mysterious mercenary warrior who has never yet lost a battle. But her terms are unsettling: she will name her price only after the Norlanders have been defeated. A single question is left for the Shadari: is there any price too high for freedom? 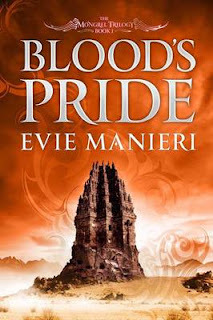 Fantasy has long been convoluted with stereotypes and simplistic styling’s that allow the reader to delve into a world without real depth, then came George RR Martin’s A Song of Fire and Ice, Steven Erikson’s Malazan Book of the Fallen and now Evie Maniere’s First Book of her Shattered Kingdom’s series, Blood Pride. To say its complex is an understatement, the characters wonderfully rich and diverse with each following their own path during the catastrophe that has unfurled. Add to that a multifaceted tapestry of world building that works wonderfully well and a whole host of heroes and villains to root and boo for which really will leave you without a chance to catch your breath as one chapter unfurls into another. Finally add to this a clear understanding of how each culture has developed; a delightfully dark and delicious plot which when added to an author with a good understanding of pace alongside prose will leave you in no doubt demanding more. All in a great read and one of my tips to watch this year in the Fantasy debuts categories of a number of awards. It’s going to take some beating.